- Size: 38, 100, 150, 200, 250, 300, 315, 350, 400 or 450 mm as well as in 3, 8, 12 or 18 inches. Our company has established itself as a leading manufacturer and supplier of superior quality Test Sieves. Size: 4" , 8" , 12", 18"
Size: 4" / 8" / 12" / 18"
The Frame is made of spun stainless steel without any joint in it. We offer clients a wide range of test sieves, which is made of SS 304 and SS 316 or Brass Frame. 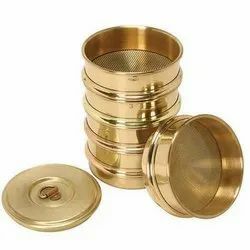 Test sieves having circular shape made from seamless upon brass sheet with S.S. sieve cloth of different mesh as under. Specification. As per these, we produce sieves up to the range of finest mesh & micron mesh size. 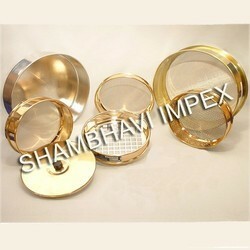 We also provide the lid & receiver on request by the clients. Apart from this, we also provide the Automatic Sieved-Shaker Machine, which functions by the Ro-Tap motion.